Measure and Report Temperature with Network Temperature Sensors. Network Temperature Sensors For Accessible Monitoring. A network temperature sensor is a tool for monitoring temperature at a distant network site in a telecom environment. What if, instead, you work for a company with IT resources housed in a data center, server room, or server closet. In that case, a network temperature sensor can also be used for monitoring your mission-critical IT assets. It is important to consider how you want to monitor your temperature sensors. The size of your network will be a major factor in determining what is the most convenient. If you work for a small or medium company where a 24-hour monitoring center is not available, you'll need some way of getting temperature alarms after hours. Server rooms and remote sites, it seems, always like to overheat in the middle of the night when you'd rather be sleeping. A temperature sensor can alert you to HVAC equipment failure before your equipment is damaged. Then, you can act quickly to get your HVAC equipment back online or shut down equipment to prevent damage. Network Temperature Sensors Are Best for Small Centers. For this type of situation, you'll be best served by a network temperature sensor. It will be wired into an alarm remote. The remote will notify you directly if the temperature level is becoming a concern. One way to do this is via email. Of course, if you choose this method, you need to make sure your email address is feeding into a BlackBerry(R) smartphone or a computer or some other device with a nice audible alert. Otherwise, you could wake up in the morning with a downed network and an email inbox full of alert messages that could have saved you. Larger Networks Will Need A Full-Featured Remote. Of course, you might work for a large company that already has a 7x24 network operations center. 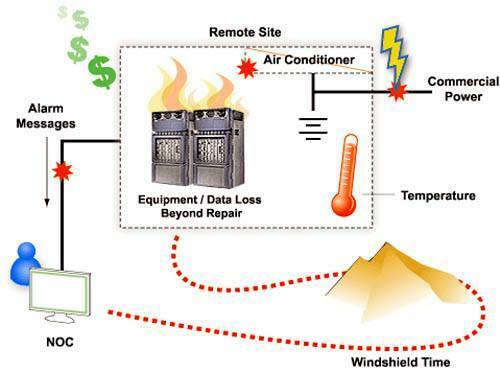 You know that the preferred method for monitoring network temperature sensors. You need an alarm remote that will report alarms back via SNMP or some other standard protocol. All of the same monitoring benefits I described above will apply here, but the method of alert will be different. Instead of the alarm remote notifying you that the temperature is moving out of the acceptable range, it will send an alert message to your SNMP manager or other central monitoring master. Then, as with all of your other network alarms, your SNMP manager will make decisions about who to contact. If your NOC center isn't staffed 24 hours a day, it may make after hours phone calls in just the same way the alarm remote did in the previous example. If your NOC is staffed 24 hours a day, however, your SNMP manager will probably just display an alert message on the continuously staffed console screen. How Alarm Remote Telemetry Units Integrate with Network Temperature Sensors. As you know, there are some network temperature sensors out there that actually have a built in NIC to connect via LAN. These could be useful if you have an very small monitoring need. Still, more capable alarm remotes provide much more monitoring ability. They also have greater reliability. What's more, they don't involve much more investment than temperature-only sensor devices. Even simple gear needs a chassis. Even simple gear needs a power supply. If you're buying, get all that you need. Even if you only want to monitor temperature at your various network sites, an alarm remote device helps you to do that better.A standalone device only has one temperature sensor. It can only monitor temperature next to one device at the site. An alarm remote can accept inputs from several or even dozens of temperature sensors. That gives you a much more granular ability to spot troublesome "hot spots" within your equipment racks. What about water on the floors surrounding your equipment racks? There are sensors to monitor this as well? What about generator fuel levels? What about battery voltage? What about open doors? What about motion sensors? What about the equipment alarms that your network gear outputs via contact closure? The TempDefender IT is a complete environmental monitoring solution. It tracks temperature, humidity, air flow, and other values at your remote sites. If you'd like an alarm remote to call your phone with a voice alert when it notices a problem like "high temperature", consider the NetGuardian LT. It's recommended for its small size, good capacity to host multiple sensors, high durability and reliability, and reasonably low cost. If you have a larger network with a NOC center, look instead at the NetGuardian 832A. It can collect alarms from dozens of devices and sensors, and it will output alarm information via SNMPv1, SNMPv2c, or SNMPv3. It can also output alarm messages to multiple SNMP managers simultaneously to support redundant geodiverse SNMP managers for improved disaster recovery. A NetGuardian RTU is a full remote monitoring solution. It tracks temperature/HVAC equipment at your site in addition to your other equipment's discrete contacts.